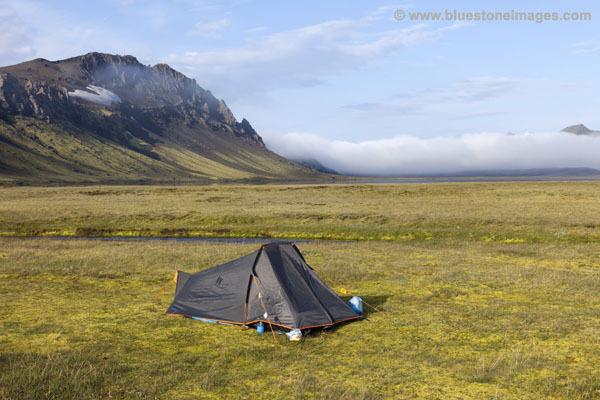 Fortunately by the time we had grabbed something to eat and taken down the still wet tents the cloud had rolled back across the lake revealing a blue sky. It looked like we were in for another hot day. 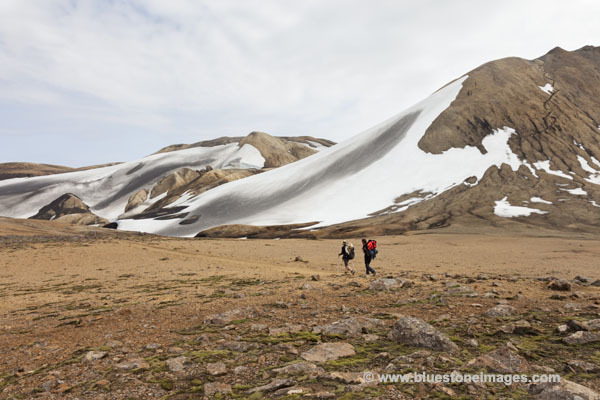 Today we would be going against the flow of trekkers as we headed to the Hoskuldsskali hut, a bleak place of volcanic ash set below a small col.
After a short while we had an easy stream crossing on a rickety plank bridge that sagged into the water as we crossed, or at least it did when I stood on it. 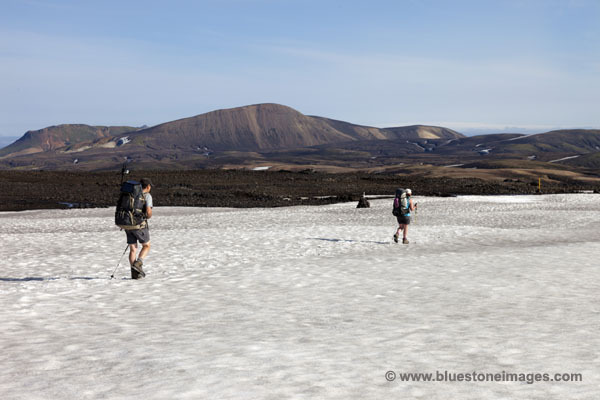 This was followed by a gentle uphill stroll to the base of Jokultungur. Next it was a bit of a steep pull onto the top via a loose scree covered path. Going up here my sciatica began to cause problems. Having had four separate slipped discs and surgery to remove one of the discs years ago I knew this was a warning I was overdoing it. One of the problems with a heavy pack on steep loose ground is that I tend to lean forward and for me this means that scar tissue begins to limit blood flow to the nerves. 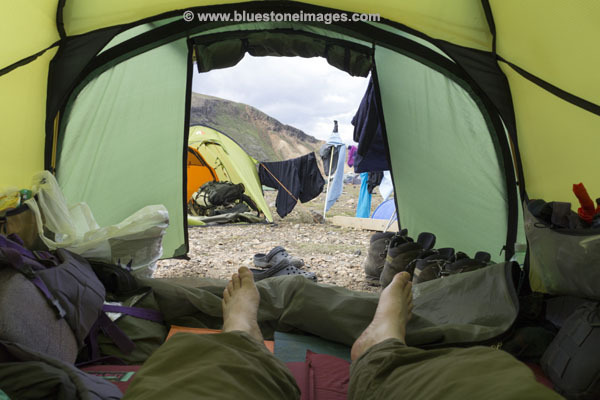 After lengthening my poles to help adjust my posture and tightening the waist belt on my rucksack to make sure it sat on my hips fully, I moved cautiously on. 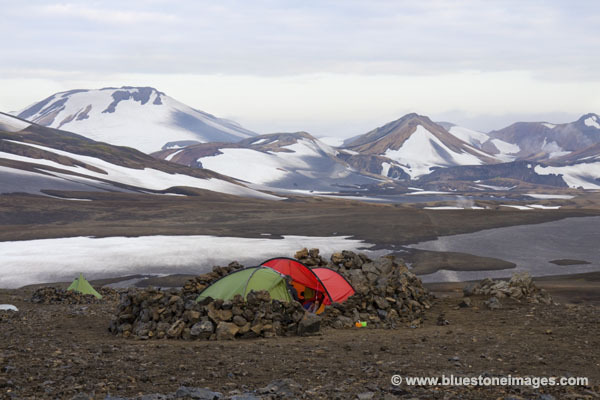 Despite feeling a bit sorry for myself the views opened up with every step and soon we could see down to last nights camp at Alftavantn and way beyond to the Myrdasjokull and Eyjafjallajökull glaciers. 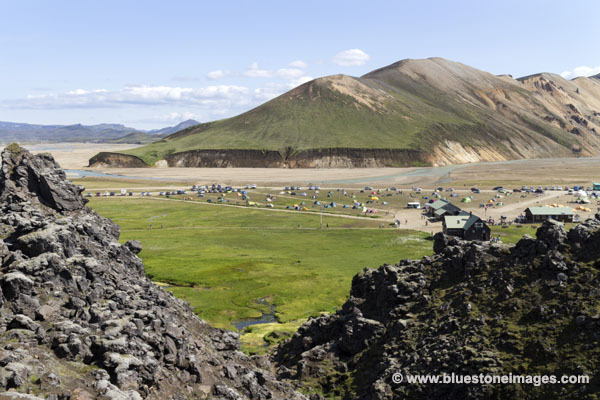 Since the eruption of the Eyjafjallajökull volcano in 2010 people have been waiting for the much bigger Katla volcano to wake up. This sits under several hundred meters of ice and will be spectacular when it does so. 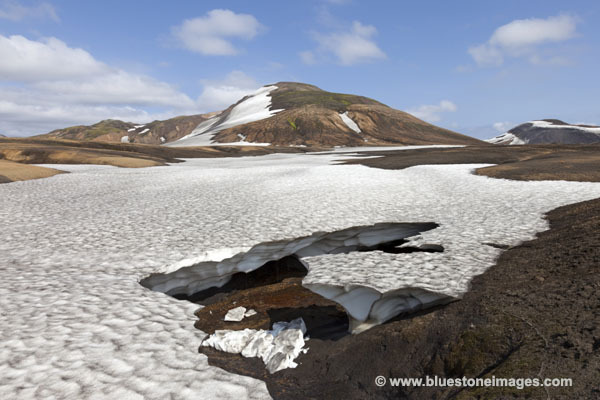 Historically Katla has always erupted shortly after Eyjafjallajökull, but so far has only rumbled quietly under its icy blanket, sending out the odd flash flood to remind folk it's there. Part way up I stopped to chat to a couple of guys coming down who asked if the big lake down there was Alftavatn and how long had it taken us to get here. I was surprised to see they were navigating with a few pages copied from a guidebook. Once on top I dosed myself with painkillers and anti-inflammatory tablets and had a bit of a moan. The others, well used to my bleating, ignored me and went on about their various aches, pains and blisters instead. Setting off again it was relatively easy going with much more gentle ups and downs until we came to some steam vents. This was followed by a series of ridges and hollows to where the trail eventually makes its way along the top of a cliff giving extensive views all the way to the hut. This was declared a good spot for lunch. As everyone was suffering from transient deafness when it came to placing someone in frame to give a sense of scale, I made do with a passer by who just happened to sit down for a break. Sometimes I find it hard to get my head around the actual colours these mountains are made up of. Some were made up of layer upon layer of pastel greens, blues and lighter browns. 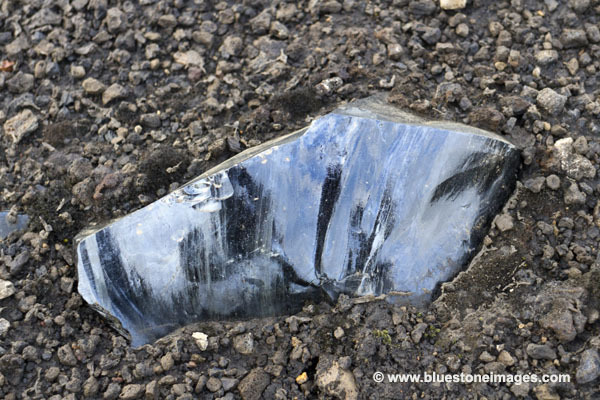 These contrasted sharply with the dark browns, jet-black ash and the white of snowfields. The last part of the walk to the camping area next to the hut was a fairly miserable experience for me. Hot, footsore and with serious backache the last couple of kilometres really seemed to drag. This was made worse by the fact the snow bridges where the path went were clearly too weak and we had to detour steeply up and down the sides of several gullies in order to reach the hut. They were really only minor detours but frustrating given how close we were. Moira went off to pay the warden while I downed yet more painkillers and fretted about whether I would be ok to keep going. Once the tents were up we had some food and a couple of brews and chilled until around 8.30pm. 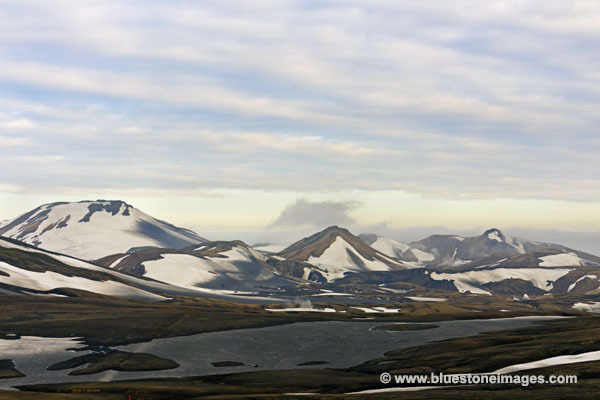 Despite being a bit of a bleak place of obsidian boulders, ash and blackened snow patches the views were magnificent. Eventually G&S headed to their tent, but we hung around for an hour hoping to catch a sunset. Despite looking promising a couple of times we weren't treated to a colourful sky and as a grey veil of high cloud moved in and the temperature fell we too headed to the comfort of our sleeping bags. Despite being woken several times during the night with backache I did not feel too bad. In fact in contrast to yesterday afternoon, I was fair skipping along once I got going. Mind you I only had to manage 12k today and most of that was gentle. 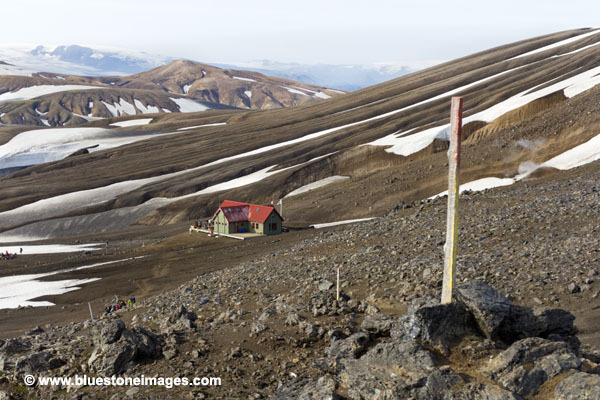 Taking one last look at the Hoskuldsskali Mountain Hut and the view beyond to the the Myrdasjokull icecap we were soon crossing the snowfields of the Sooull plateaux area. In 2011 when we came this way it was cold and windy, but today under a warm sun with far reaching views, it really was an absolute pleasure. 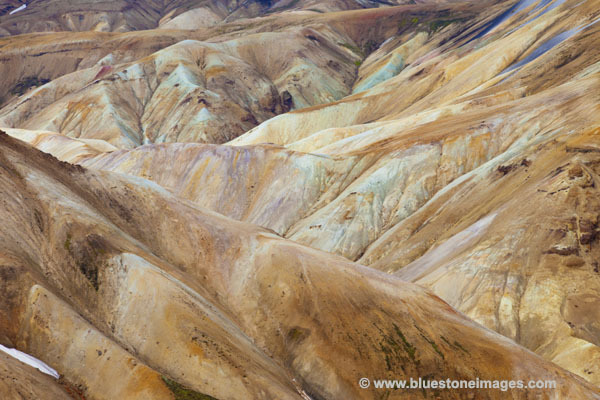 Yet again we were treated to some wonderful rock colouration where volcanic deposits had leached out of the earth, staining the ground turquoise and giving the landscape a strangely industrial appearance. 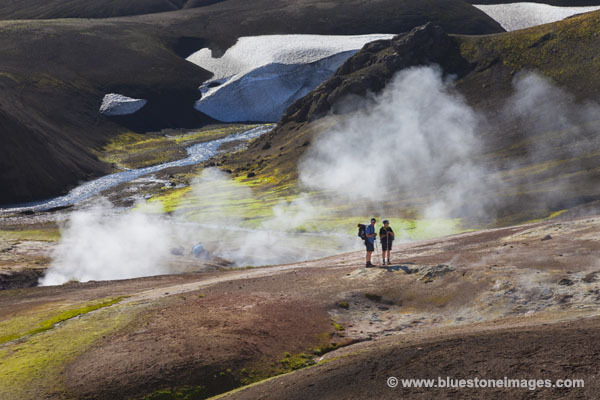 After a while we reached the Storihver geothermal area and left the path to have a look at the hot springs. These turquoise pools appear to be a wonderful place to soak away a few aches and pains, but as you get closer and the heat and sulphurous smell hits, you soon realise you would cook like a lobster in seconds. 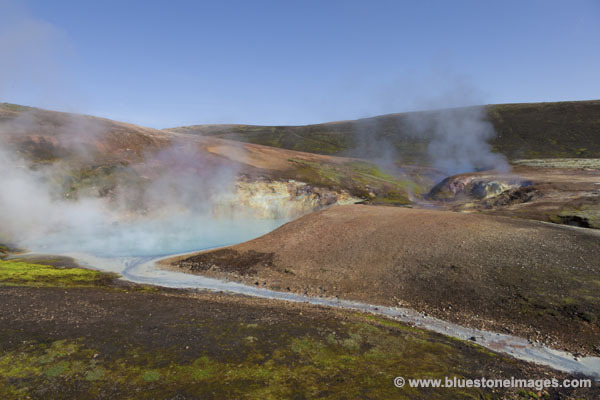 These are certainly not the friendly welcoming pools experienced in Landmannalaugar, instead these springs combine beauty with menace, as they hiss sulphurous gas, gurgle angrily and spit boiling water. Moving on, the trail initially cut across the grain of the land and we were forced up and down a series of short steep ravines with broad ridge like tops. 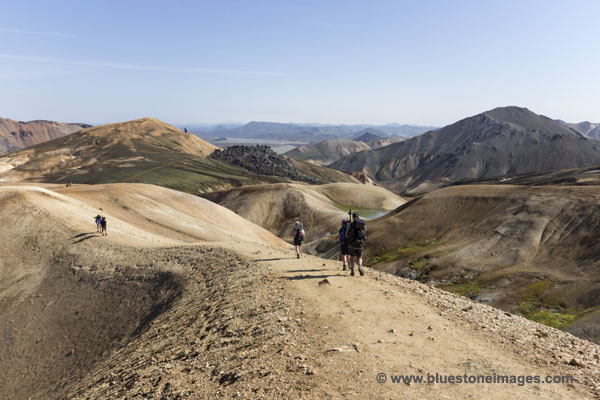 In the heat of the sun they could have become hard work, but fortunately they petered out in a small plateaux that marked a change from an east west watershed to a northerly one in which the streams drained towards Landmannalaugar. 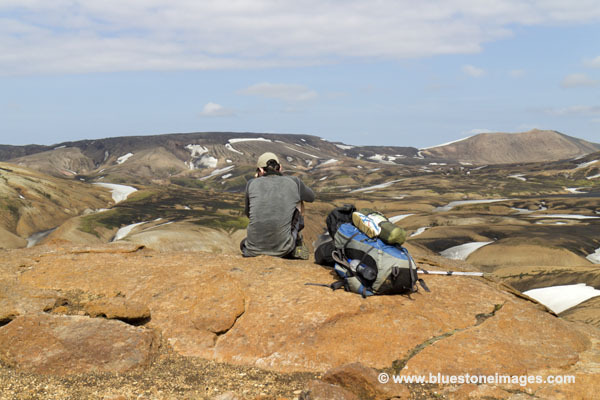 In this area there was no vegetation to speak of and I was again struck by how quickly the landscape of Iceland can go from lush green to completely barren. The going was now easy as we made our way along series of ridges that were now aligned with our direction of travel. 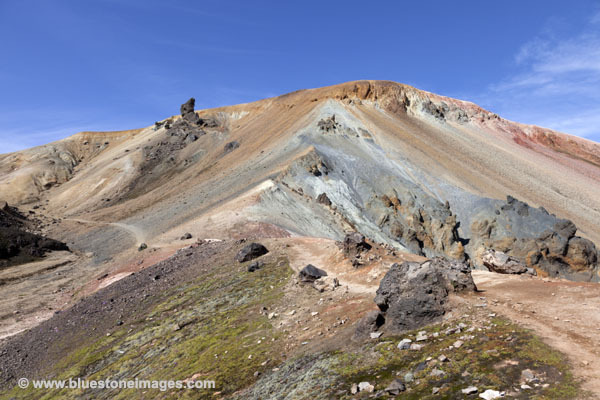 Ahead lay the colourful and still active Stratovolcano Brennisteinsalda volcano with its distinctive finger like pinnacle of lava. 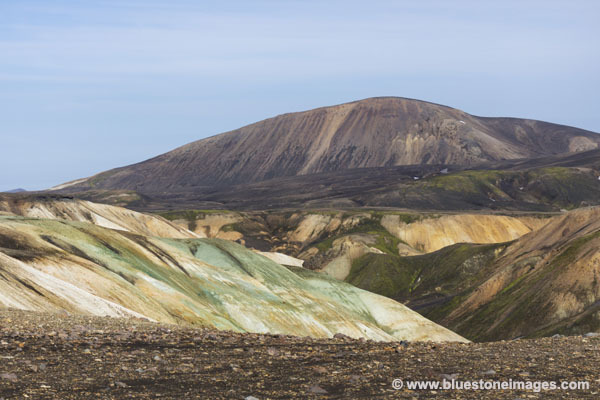 When it erupted in around 1480 it produced the lava wall that sits above the campsite at Landmannalaugar, some forty five minutes walk away. 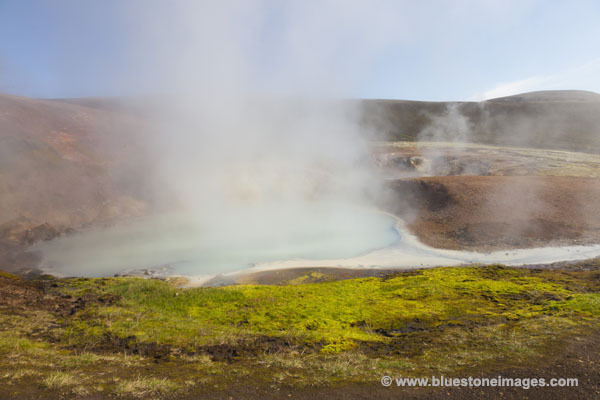 It also provides some nice hot springs for the weary trekker to relax and soak away a few aches and pains. 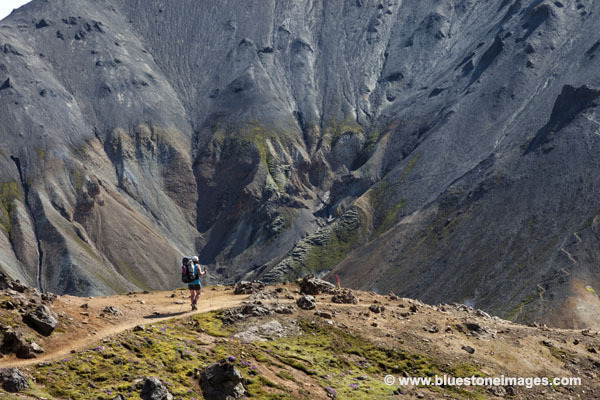 Once past Brennisteinsalda the trail takes you towards the mountain of Blahnuker, the blackened ash slopes of which dominate the view east. 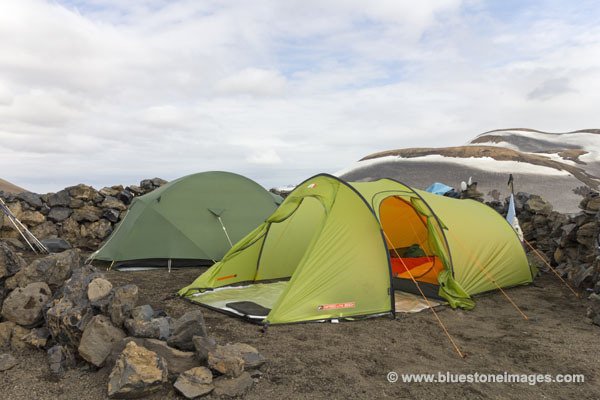 Half an hour later we were among the obsidian boulders and tortured lava shapes of Brennisteinsalda's old lava field and in meeting increasing numbers of day trippers we knew the campsite would soon come into view. 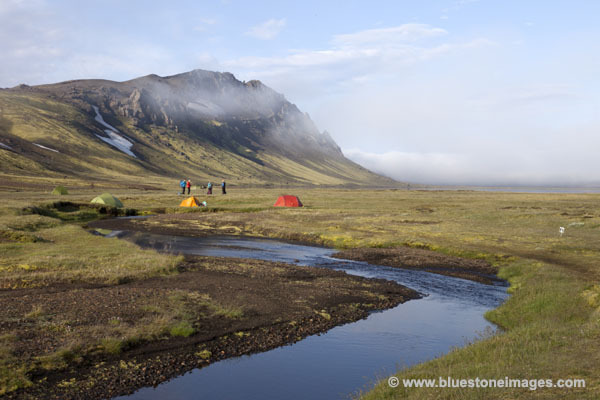 The campsite here is not the nicest of places to be as it's pretty crowded and noisy, but as wild camping is discouraged in the Fjallabak nature reserve there is little choice. Fortunately the setting makes up for this and it does have a small shop, toilets, showers and hot springs to bathe in. 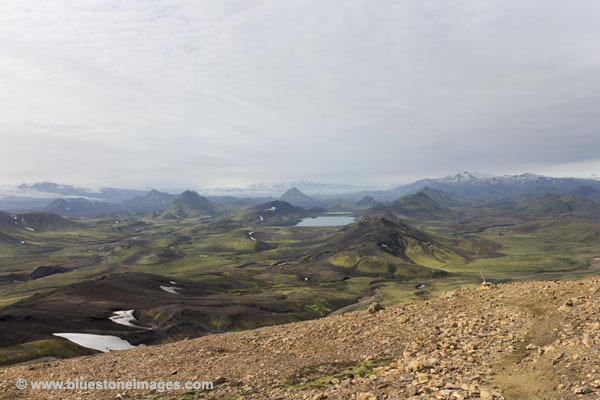 The plan was to spend a couple of days here peak bagging before heading back to Reykjavik, hiring a car and heading up to Skaftafell to explore that area a little.